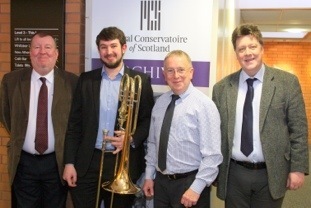 SBBA is delighted to announce a new relationship it has facilitated between XO Instruments (part of Korg UK’s family of brands) and the outstanding young Scottish bass trombonist, Josiah Walters. This exciting step welcomes Josiah as the first young clinician to assist with the development of the new XO range of trombones. To officially mark the start of the collaboration, Josiah was presented by Nigel Lawless, Sales Manager for Korg UK, with a pristine new bass trombone from the XO series. Josiah is a student of the Royal Conservatoire of Scotland, a recent winner of the BBC Radio 2 Young Brass Musician of the Year, a composer and an arranger (performing his own brass band arrangement of Chris Brubank’s challenging ‘James Brown in the Twilight Zone’ from the renowned ‘Concerto for Bass Trombone and Orchestra’ as part of his winning programe). Described by the BBC Radio 2 YBMY judges as “A player who encompasses everything good about the bass trombone”, and with such an impressive musical pedigree at just 20 years old, Josiah was an obvious choice as a rising young star who could positively contribute to the development of the trombone range.